Senior Libby Benzer put the cherry on top of an amazing season with a Monsignor Martin cross country individual title in her final All-Catholic championship race after finishing third last year and second in 2015. Benzer finished with a time of 20:59:90 at Knox Farm State Park, almost a full minute better than the second place finisher. You can read more about Libby's victory in The Buffalo News here. Senior Libby Benzer was named Section VI runner of the week for the week of September 27, 2017. 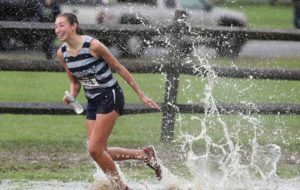 Benzer has been exceptional in her final high school season, leading the St. Mary's Women's Cross Country Team in every way possible. Check out her name in lights here.